Three years ago, I bought a Samsung Galaxy Tab Pro 8.4 tablet during a Black Friday sale. It’s since served me adequately as a digital comic reader and for watching videos. However, the tablet recently started having major problems, including the screen coming loose and spontaneous reboots. The lack of updates from Samsung, who abandoned the tablet months after I bought it, is also something I found off-putting. (Especially since it cost almost what an iPad Mini ran.) And, of course, a lot of Android apps aren’t particularly optimized for tablet-sized screens, just phones. Overall, it’s made me vow to never buy another stock Android tablet ever again. As such, that makes my future tablet options either Apple’s iPad (running iOS) or Amazon’s Fire tablet (running Fire OS, a modified version of Android). Since my current finances don’t permit me to buy an iPad, I’ve opted to go for a Fire tablet. Amazon had the new 2017 Fire HD 8 (an 8-inch tablet) on sale for Black Friday/Cyber Monday, so that’s the model I bought. 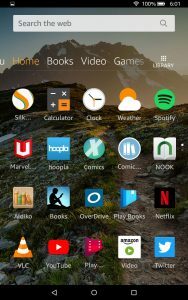 While others have given a pretty thorough technical analysis of the Fire HD 8, I’ll just give a summary of my experiences with it so far. The first thing I did with the tablet was sideload Google Play, following these instructions. Amazon runs its own app store, but it has a smaller selection of apps versus what Google Play offers. One example: I wanted Marvel Unlimited on the tablet, which Amazon’s app store doesn’t carry. So far, the sideloaded Android apps work fine. I’m able to enjoy reading Marvel Unlimited, plus use LastPass’ Android app to avoid re-entering numerous passwords. I’ve also loaded of the Google apps I normally use, such as Gmail, Drive, Docs, and Keep. The Fire HD 8 has an OK screen (1280 x 800 resolution). Its capacity starts at 16GB (the model I bought), with a MicroSD card slot to increase storage. Amazon Prime subscribers also get lots of Prime features directly integrated into the Fire OS, though I opted to not renew past the trial. I don’t shop on Amazon that often these days, and I prefer Netflix/Spotify for streaming video and audio. The Fire HD 8 is also quite cheap (standard retail price is $80, and even less during holiday sales), but lacks some of the downsides of similar cheap Android tablets. Amazon, as far as I can tell, pays somewhat more attention to updates/support for the Fire line. For those that care, Alexa support is included, but isn’t voice-activated. Not having a use for Alexa (or similar voice-activated services like Siri, Google Assistant, etc. ), I haven’t tried it on my tablet. One downside of the Fire HD 8 is that it’s, well, an inexpensive tablet. It’s no iPad in terms of quality or speed. Similarly, there are ads (“Special Offers” as Amazon calls them) on the lock screen if you didn’t pay for an ad-free Fire version. However, Amazon lets you pay a fee if you decide later to remove the ads. The build quality’s OK for the price, but it might be worth buying a case. The plastic construction sometimes makes the Fire tablet feel a little slippery for me. So far, the Fire HD 8 has been an adequate tablet for reading comics and watching videos. 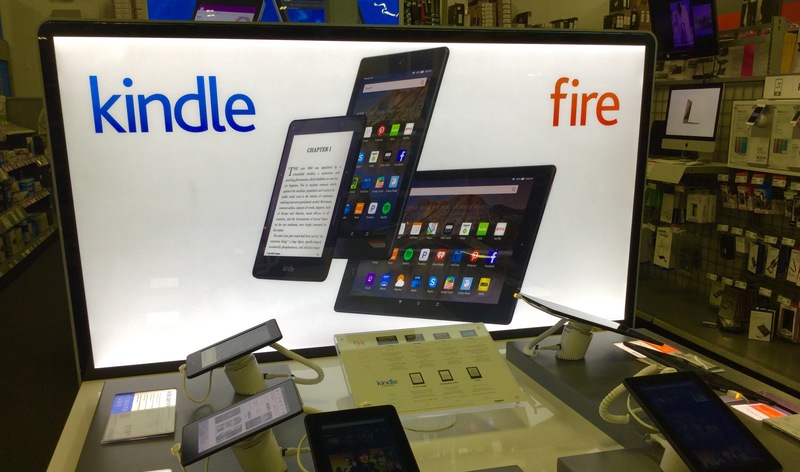 While an iPad would be nice to have, the Fire HD 8 is more affordable, and is serviceable. I still advise those looking for a Fire tablet to either stick with the HD 8 or consider the new $150 HD 10 model, and not get the $50 Fire 7 model. The lower-end specs aren’t worth the $30 saved.